Join us every day at this time during Share the Love month as we introduce you to one of our lovely authors at Outskirts Press. Peggy Mullins, B.A. Psychology, George Mason University, lives in Virginia with her husband and has a deep love for horses and dogs. She works as a freelance writer, and Everybody Loves Ika is her first book. To learn more, visit everybodylovesika.com or peggymullinsauthor.com. 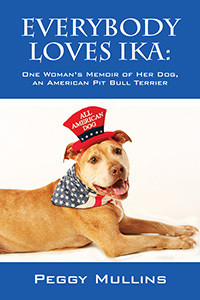 Follow Ika’s adventures on his blog: everybodylovesikadogbook.blogspot.com. The healing power of a dog’s love. Peggy Mullins grew up in a hellish adoptive home with distant, abusive parents who found every opportunity to damp out the tiny glimmers of happiness Peggy managed to cling to in such a cold environment. Ika, a beautiful Pit Bull pup, was spared at the last moment from being born into a similar hell. Though his mother and many of his siblings didn’t make it out of their gruesome home alive, Ika survived thanks to the skilled and compassionate work of a quick-thinking vet and a few big-hearted volunteers. In time, Ika found his way to Peggy, who would give him a loving permanent home in which he would thrive. In return, Ika would teach Peggy the kindness, patience, and unconditional love that had long been absent from her life. Along with the surprising affection of a special man and a spectacular family of animals, Peggy’s book poignantly guides readers through her difficult journey toward healing and peace.